The Waldorf fifth grade life science curriculum challenges students to observe, draw, connect, and think about living organisms, especially in the fields of mycology and botany. 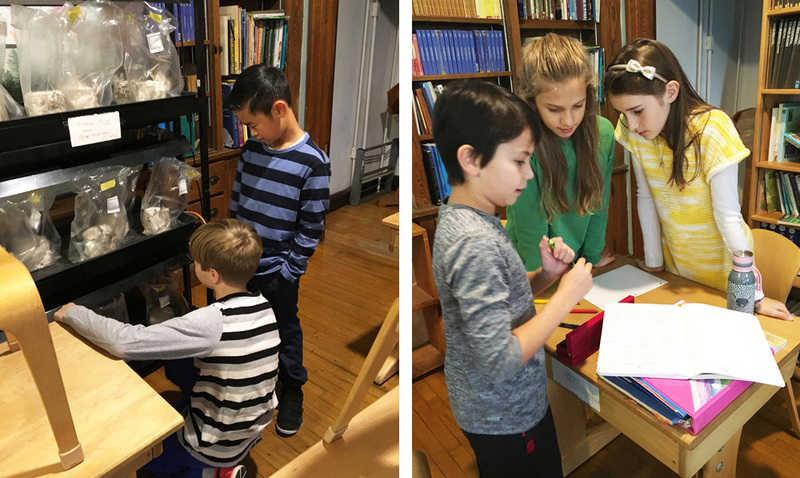 In grade four the students studied zoology and observed animals in and around their homes. It is easier for children to develop a feeling for animals because many of them have pets. Plants and fungi, while also living organisms, are quite different. It requires more effort and patience on the part of the observer to truly watch and see them interact with their environments. The students’ interest in these living organisms was piqued when they heard that the largest living organism in the world is the Humongous Fungus (Armillaria ostoyae) in Oregon. Its mycelium covers an area of almost 4 square miles. After learning that the mushroom is just the fruiting body of the fungus, the class went on mushroom hunts while at Hawthorne Valley Farm as well as in the conservation land behind the school. …then observed and recorded their findings back in the classroom. We found fungi in a variety of shapes, sizes, and colors. The internal and external features of their fruiting bodies were discussed and sketched back in the classroom. The actual fungus that lives and thrives in the dark of the soil or in bark and wood was much harder to spot. To show students the actual organism—the fungus that grows, feeds, and spreads with the help of fine threads of mycelium—I decided to grow oyster mushrooms with the class. 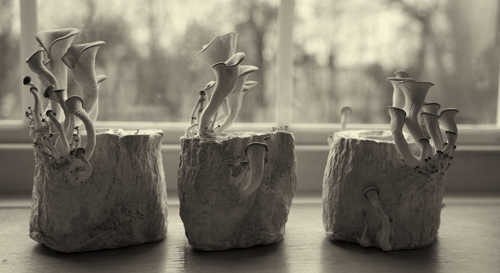 Unbleached toilet paper rolls soaked in warm water and filled with grain spawn were the beginning of oyster mushrooms. First we soaked organic, unbleached toilet paper rolls in warm water and filled the center tubes with grain spawn. Next we placed these inoculated paper rolls in tipi-bags and kept them in a warm, dark place on a shelf-grow-system for about 3 weeks until the mycelium had begun to cover the paper rolls. After 48 hours in the school’s fridge, we opened the bags and exposed them to daylight in the classroom. Within a week to 10 days, beautiful little clusters of oyster mushrooms fruited and grew. The class took the harvest home for Thanksgiving! The children were amazed at the speed with which the fungi fruited. Comparisons were made to the size and shape of the mushroom caps, their colors, and their location on the paper “log.” We discussed the influence of the classroom and home environments on the growth of the fungi. One student created a comparison experiment by choosing a regular, bleached paper roll, which fruited about a week later than all the others and only from the center location where the grain spawn had been placed initially. This hands-on experience allowed the fifth graders to learn about the need for time, space, patience, and an open mind to make good scientific observations. It was a rewarding experience to observe a fungus grow from start to finish, which is very different from collecting wild mushrooms or buying them at the store. The students are currently writing about this experiment by creating their first ever science poster as a group. Observation, measuring and recording, and asking questions are cornerstones of the Waldorf approach to teaching science. As this project illustrates, the Waldorf science curriculum is not textbook based. Rather than simply read about science, our students do science. By actively participating in the activities of science—observing, wondering, documenting, comparing, and analyzing—students become engaged and excited by science. This enthusiasm is the flame we hope to light across the Waldorf curriculum, developing passionate learners who can pursue their interests and fulfill their potential, both as students and as citizens of a complex, global world.